Completing a PeopleSoft test plan to support your test strategy requires you to define each test phase and the associated business processes and scripts that will be run during that phase. While not a trivial undertaking, most companies have many of these pieces. This article will help flesh out and organize a more structured process. A Test Script is a series of steps to test a single piece of functionality in the system. For example, enter a journal entry, add a time card. Each script is created individually to perform that single business task. In addition, test scripts often need to be duplicated to process variations in that script. An example of this is a script to add a vendor, versus add a 1099 vendor, where the same script is executed with some variation in the process or the data. (In this case the second script would have additional data to enter to designate the 1099 vendor). Additionally, you may run the "Add a Journal" script as a process variation to a closed period, or to add an intercompany journal. A Test Case is a combination of related test scripts covering a particular area of processing, and run in a particular order. For example a test case for Basic Journal Processing includes scripts to add journals, edit journals, correct errors, and post journals. PeopleSoft is a data-driven system, Test Data drives testing. A Test Plan for a new implementation should focus more on testing configuration date; and upgrade Test Plan may emphasize transaction data and scenarios. It is important to consider not only the test data, but to also specify the expected results this data should produce. Finally, prior to the beginning of testing, in addition to the four components above, module testers will need to secure the reports and queries that will be used to reconcile the test results. In an implementation or upgrade, in System and UAT testing, conversion data will also play an important role in assuring the validity of the data itself. Business users will identify key reports to run in production for data that has been converted, or moved to a new release, and save the results for later comparison. Equivalent reports will then be run in System test and UAT and reconciled to these saved reports. Testing a suite of PeopleSoft applications also requires organization and communication. As we have done in other posts on PeopleSoft testing, we include here some examples/templates to guide your thinking.I've chosen Benefits Admin from HCM. Other modules from HCM, and applications from Financials and SCM would follow a similar structure and format. 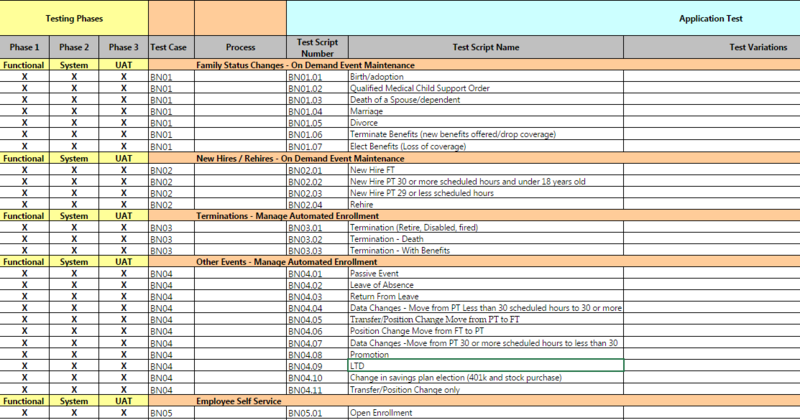 For Benefits in HCM, we show below a list of the first four of twelve or so test cases we use to define test plans for the Benefits Administration module. Test cases are numbered and the test scripts needed for each case are identified. Each test case is a combination of related test scripts covering a particular area of processing. Next, we show an example of a test script definition (below) which defines the steps needed to test a single piece of functionality. 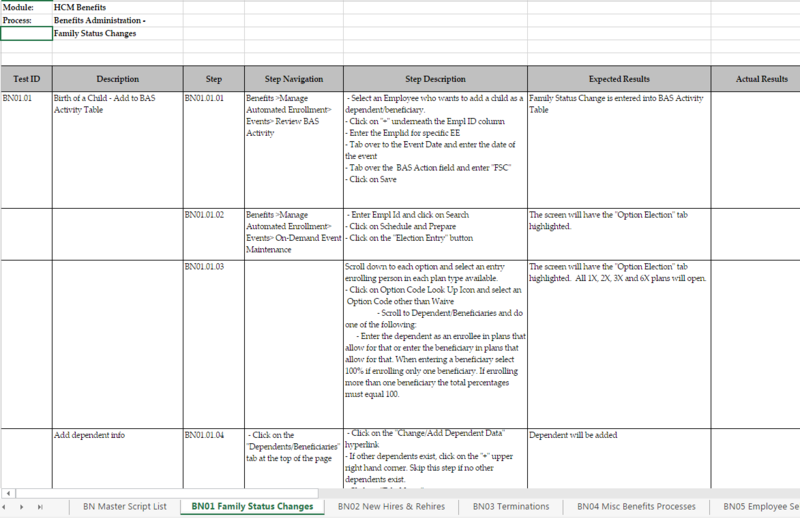 The illustration shows the first steps for a script to test Family Status change due to a new child. The illustration shows the first four (of 16) steps to add a new dependent and enroll her in various benefits. By step, the script defines the user navigation, a description of the page activities, and the expected results. Whether this script is automated with a tool like BEAM Test, or whether this script is done manually, a set of definitions allows the organization to define, manage and execute tests in an organized and consistent process. Testing PeopleSoft can seem a daunting task. Understanding the types of PeopleSoft testing, the organization of a PeopleSoft Test Strategy (with goals and policies) and Test Plans, along with this definitions of test cases, scripts and scenarios, gives you a proper PeopleSoft test framework (if you will) to deploy reliable systems, on time, and on-budget.